Our weekly round-up of time capsule news includes a group of kids in Ohio who sealed an Xbox into a capsule, the tragic story of a recently unearthed time capsule from 2003 that didn't fare too well, and a new Tesla monument in Silicon Valley that includes some predictions for the world of 2043. 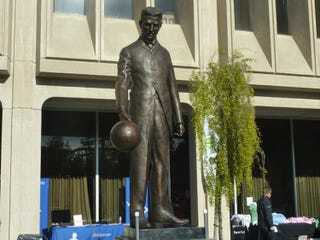 A small crowd gathered in Silicon Valley last weekend to see the unveiling of a new monument to famed inventor Nikola Tesla. The crowdfunded 7-foot statue of the internet's favorite historical geek sits in Palo Alto and serves as a free Wi-Fi hotspot. Proving yet again that time capsuling is hard business, two metal cylinders buried just 10 years ago were recently unearthed in a pretty sorry state. A group of 25 young adults in North Carolina were disappointed to learn that their time capsules—originally buried in 2003 when they were 5th graders—had been reduced to plastic bags of mud. "I can't believe it. I researched how to do this and everything," 5th grade teacher Susan LaMarre was quoted as saying to her former students.